The number eight was WILD as the Brewers defeated the Pirates 3-2 Saturday night for their 9th win of the season, 8th in a row, and lead the N.L. Central with the record of 9-2. 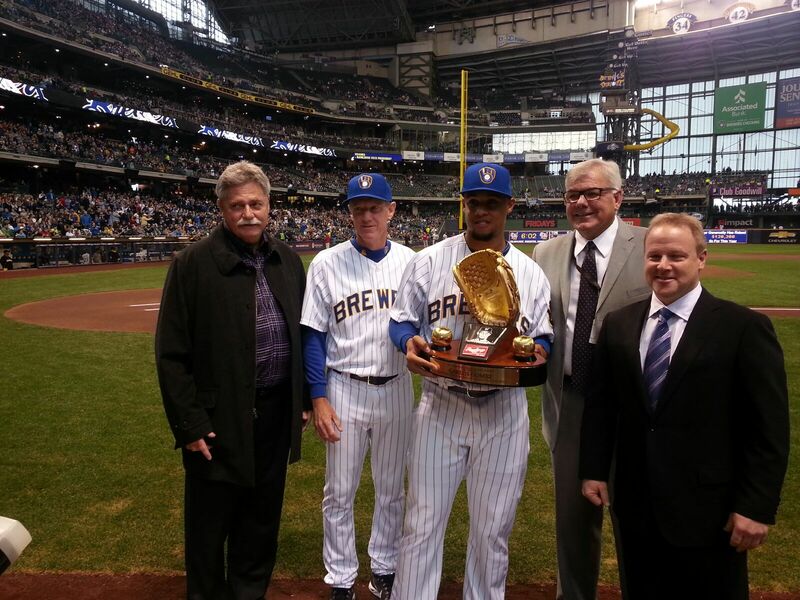 Carlos Gomez before the game was presented with the Rawlings Gold Glove Award for his play in center field last season. Gomez is the 10th Brewer, and second Brewer Outfielder (Sixto Lezcano 1979) to win the award, finally putting to rest the team’s 31 year drought without a winner, which was the longest in the Majors. Gomez accepted his award, and promptly led off the bottom of the first with his 4th round tripper of the season, it’s also the 2nd game this season he had led off with a home run. The game stayed notched at two until the wild 8th inning rolled along, and 42,000+ fans found out just how special this team is. With one out in the top of the eighth and Pirates at the corners, Andrew McCutchen popped up to catcher Jonathan Lucroy which set off a chain of events leading to a RARE 2-6-1 double play to end the inning. Lucroy would also play a key roll in the bottom of the 8th as well. The Brewers came out swinging after being all charged up from the exciting and unusual end to the top of the inning. Ryan Braun with one out, singled, followed by Aramis Ramirez who also singled, then with huge momentum building, Jonathan Lucroy hit a sharp single to right field scoring number 8, Braun giving the Crew the lead at 3-2. Francisco Rodriguez, a.k.a “K-Rod” came in and shut the door, doing what he does best, and earned his 4th save of the season. The Brewer bullpen continues to impress, with it’s league leading .083 ERA. (In the 7th Tyler Thornburg shutdown the two batters he faced to increase that streak to 14 straight). The Brewers go for their third sweep of the young season this afternoon at Miller Park. This entry was posted in Baseball, Milwaukee Brewers, MLB, sports and tagged double play, Jonatha Lucroy, Milwaukee Brewers, Pittsburgh Pirates, Ryan Braun. Bookmark the permalink. Might as well start counting down the Magic Number!